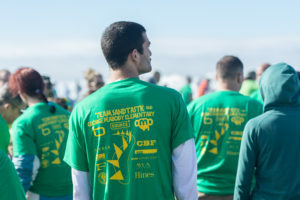 Each of our 30 teams print t-shirts for all team members including partner companies, and student participants. As our t-shirt sponsor, your logo will go on all t-shirts printed at the event! Help us provide lunch for all our teams and community volunteers during the day. Help us provide water and other drinks for our teams and community volunteers during the day. Help us print posters, flyers, and programs to promote the event. Have other ideas? Email us at sandcastle@leaparts.org. 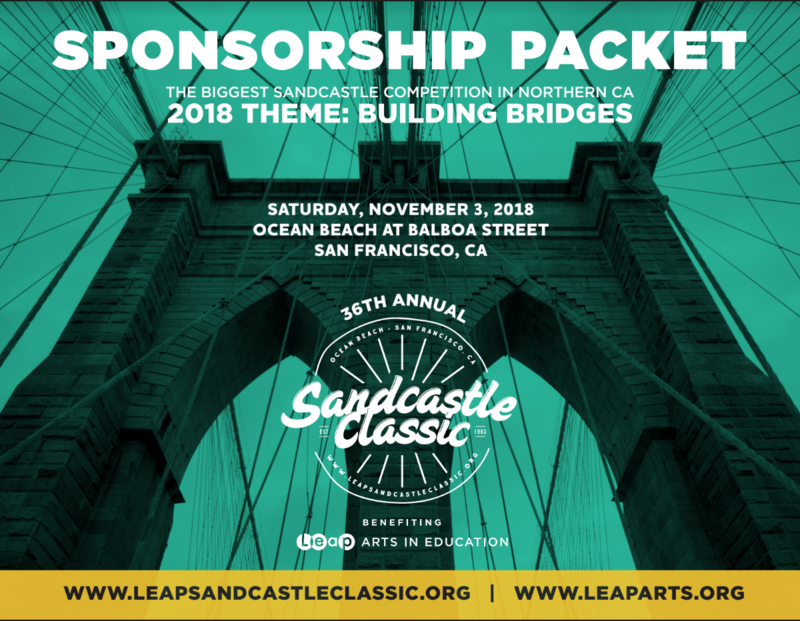 For 34 years, Leap has hosted the Sandcastle Classic, Northern California’s biggest sandcastle competition to help raise funds for our Bay Area arts education programs. This unique sandcastle competition, nonprofit fundraiser, and community event brings over 3,000 people to San Francisco’s Ocean Beach every year to design and construct creative sand sculptures on an impressive scale, with local San Francisco students. NETWORKING. A fun way to develop deep partnerships within your own industry and others. TEAMBUILDING. A great day at the beach! Employees can work together in teams and directly with students to strengthen management skills they will apply on the job. EXPOSURE. Gain recognition for your company. This is a long-standing, high-visibility annual event that draws regional and national attention. SERVICE. Investment in your community and a positive impact on local children. 100% of proceeds go directly to Leap’s visual, performing, and architecture arts education programs, serving over 6,000 children every year. Your support helps students achieve their potential! Download our Sponsor Packet here. Leap is a 501(c)(3) nonprofit organization that was established in 1979 in response to severe budget cuts in arts programs in California schools. Leap’s programs place professional teaching artists in classrooms to work with grades K-5. Every year, these educational programs—in music, dance, theatre, creative writing, visual arts, and architecture—serve over 8,000 students in more than 30 elementary schools throughout the Bay Area.